Marantz PM6003 review | What Hi-Fi? It all happened in a bit of a rush for the Marantz PM6003: First Test in October 2009 and a Best Buy Award less than a month later. After that meteoric rise, though, the Marantz has had an untroubled incumbency – until now it hasn't had to formally face down a single rival. It remains a good looker – streets ahead of most of the competition by the simple expedient of having some curved edges. Specification is more than adequate, too, with 5 line-level inputs (incorporating two recording loops), a moving magnet phono stage, switching for two sets of speakers and defeatable tone controls. The remote control is as classy and comprehensive as the rest of the package. Playing Nina Simone's hair-raising version of Weill's Pirate Jenny, the '6003 is immediately and reassuringly impressive. The traditional Marantz two-channel virtues of detail, fluency and comfortable listenability are to the fore, but in the PM6003 they're joined by a welcome injection of purposeful drive, dismissive dynamic agility and unshakeable solidity and focus. Low frequency extension is considerable, the soundstage cohesive and the malevolence and glee in Simone's vocal is delivered in spades. 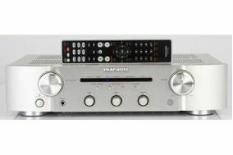 The Marantz integrates and separates each individual thread of a recording with cashmere smoothness, and has the iron-fisted authority to deal with the most awkward tempo changes and the steepest dynamic peaks and troughs with ease. Undoubtedly the best way to listen to the Marantz is with ‘source direct' selected; bypassing the tone, balance and (frivolous) loudness controls brings greater benefits here than with any other amp in this class. Configured this way, the Marantz displays powers of insight and resolution that make its position as our current sub-£500 integrated stereo amplifier of choice completely justifiable. So capable is the PM6003, in fact, that it's forced a couple of very well regarded rivals down to four-star status and (just about) fended off an extremely spirited challenge from Rotel in the shape of the RA-04SE. It's not a huge leap of the imagination to see the Marantz in the box seat to achieve back-to-back Awards, and recommendations don't come any less equivocal than that.